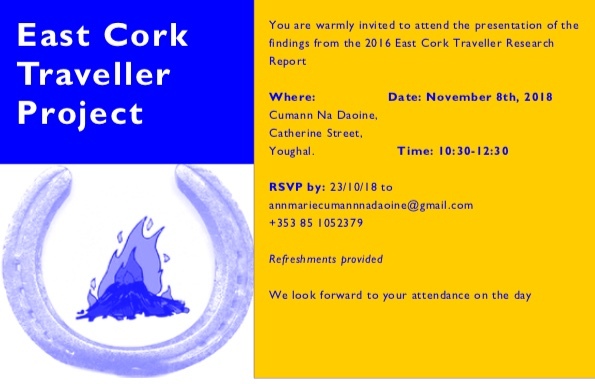 You are invited to the presentation of the findings from the 2016, East Cork Traveller Research Report taking place in Cumann Na Daoine, Youghal on November 8, 2018 from 10:30-12:30 pm. This morning will be an opportunity for all who attend to reflect, share ideas and move forward with a collective approach to working with the Travelling community of East Cork. We would welcome your attendance. Please RSVP by the 23/10/18 to annmariecumannnadaoine@gmail.com or call +353 (85) 1052379 to confirm your attendance.